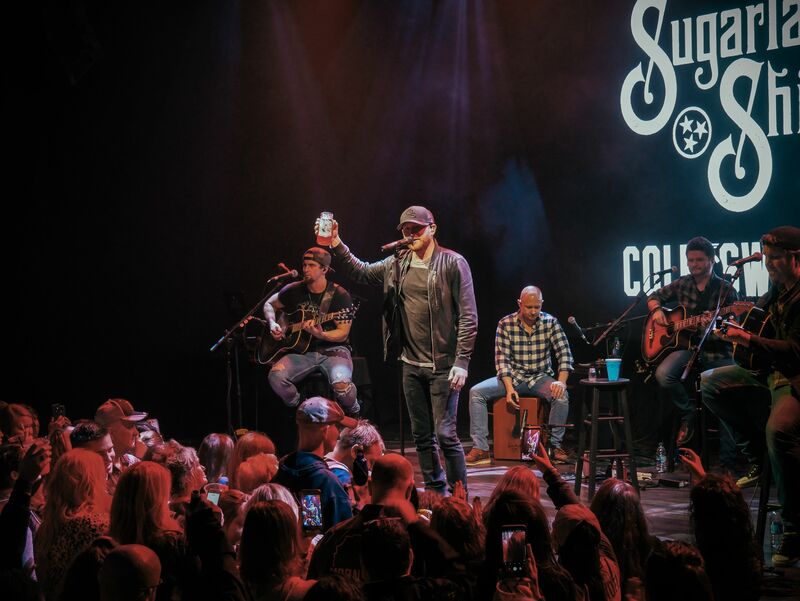 It was only appropriate that when Cole Swindell celebrated his heartbreaker No. 1 last night (Feb. 6), it came a downpour in Nashville. 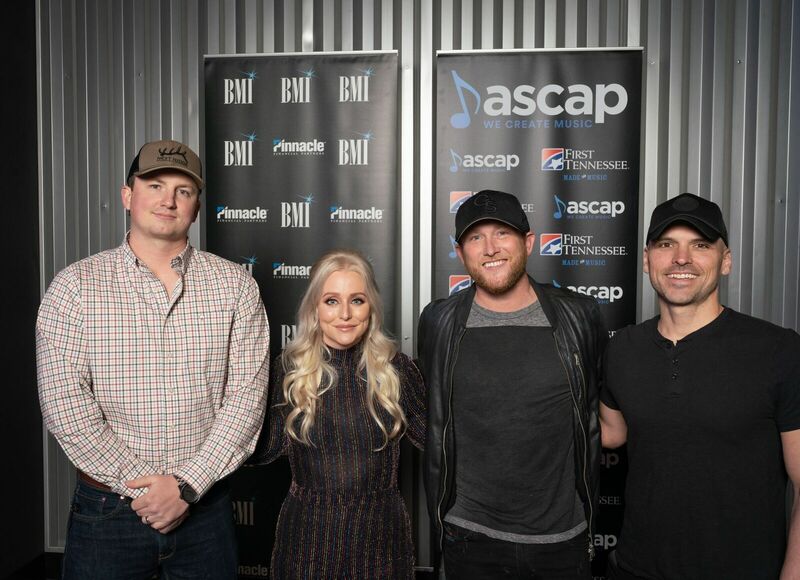 The party for the Grammy-nominated “Break Up In The End,” written by Chase McGill, Jessie Jo Dillon and Jon Nite, was thrown by ASCAP and BMI at The Cowan at Topgolf, and was filled to the brim with friends and fans of Swindell’s and the writers. Producer Michael Carter was also in attendance to commemorate his eighth No. 1 as a producer. BMI’s Executive Director, Creative, Leslie Roberts, served as the host for the rainy but heartwarming night. She made sure to make the crowd aware right away that “Break Up In The End” is BMI writer McGill’s second No. 1 and Dillon’s first. “I don’t remember not knowing Jessie Jo,” Roberts said. “We all work with so many writers and we hope they all achieve the success they dream of, but with Jessie Jo, specifically, I pictured this moment in my mind. What the song would be, who the artist would be, and of course, what would she be wearing? And here we are today; ‘Break Up In The End,’ Cole Swindell and yes, you look amazing Jessie Jo,” she said with a laugh. Roberts also presented Dillon with her Taylor guitar, as per BMI tradition. Roberts also commended Swindell for his success, with “Break Up In The End” being his eighth No. 1 single as an artist. She was also the first of many that commended him for cutting an outside song. Roberts then turned the microphone over to ASCAP’s Nashville Creative Manager, Beth Brinker. Brinker immediately thanked Andrew Kintz and First Tennessee Bank for their support. Big Machine Music’s General Manager Mike Molinar was on hand to celebrate Dillon’s first No. 1. He took time to thank Warner Nashville, their radio promotion staff, KP Entertainment, the songwriters, Carter, and more. Molinar also had almost poetic words to say about Big Machine Music writer Jessie Jo Dillon. He went on to thank the staff at Big Machine Music, singling out Vice President, Publishing Alex Heddle, who handles day-to-day for Dillon, and Becca Walls, Manager, Content and Host for Big Machine Radio. Travis Gordon, UMPG’s Senior Creative Director, was excited to speak on McGill’s success and character. He then told a story about receiving a glowing text from a publisher at a writing retreat about McGill’s work ethic; a theme becoming popular in discussions about McGill. Gordon also recognized Warner Nashville’s Cris Lacy and Swindell’s manager Kerri Edwards for all their hard work. Warner Nashville’s John Esposito was there to deliver his always entertaining remarks about Swindell and the hit. “Some things that I think are pretty amazing are in the U.S., ‘Break Up In The End’ reached an Airplay audience of over 800 million and it achieved over 1.1 million track equivalent sales. That would be Platinum, including 140 million on-demand streams. Esposito relayed that Swindell is the only solo artist in Country Aircheck history to top the charts with his first seven singles; and he now has number 8. He also presented Swindell with his Gold certification plaque, and assured that his Platinum plaque is on the way. Sony/ATV’s Josh Van Valkenburg was on hand to speak on behalf of Nite and Carter. “Jon will call me from time to time after a write and he will say, ‘Oh man, we wrote a hit today, we wrote a smash,’ or bomb or fire or whatever it is,” he joked. “But I will say that [Jon] called me right after the session and said something [and he’s] only said it once, he said, ‘I think I might have written the best song of my career.’ And you were right, this is going to be one of the best songs of your career. “I know I’m repeating things people have already said,” he continued. “But [Swindell] has created this career of integrity where you’re not scared to cut the best song. The best song wins. The truth is, you’ve written 10 No. 1 songs. You’re a killer songwriter, but if you hear one that’s special, it doesn’t matter if you’re name is on it or not. Thank you for that. Brandi Simms of the CMA was on hand to provide Swindell and the songwriters with their CMA No. 1 medallions. Producer Carter was grateful to have success with the group. Carter then passed the mic on to the man of the hour. “I’m going to go ahead and go because this is y’all’s day,” Swindell said to the writers. “I know what songs have done for me at an early age all through college,” he continued. “That’s how I started my career, writing songs. I was lucky enough to get some recorded and ended up getting a record deal. Having my eighth No. 1, the most special one and the first one I didn’t write and I wouldn’t have it any other way because I know what it’s like to have somebody believe in a song that I wrote. This is why you move to Nashville, to write songs like that. This one is going to be around for a long time. 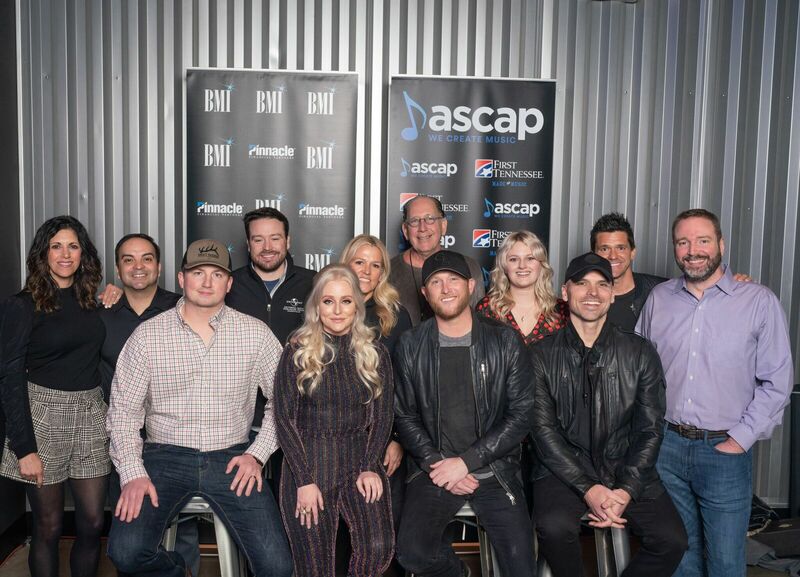 Swindell thanked Carter, Kerri Edwards and KP Entertainment, his band on the road, Sony/ATV, BMI and ASCAP and Warner Music Nashville. McGill thanked his family and raved about Travis Gordon. “He can take an iPhone tape and turn it into a Grammy-nominated No. 1 song,” he gushed. “The day we got done writing this, I was scared to death,” Jon Nite said. “At midnight after about three or four whiskeys, I sang this work tape and I was scared. I was like I love this; I feel like this is our lives and I want people to hear it and I’m scared they won’t. Without Cole and without Michael, without the amazing Warner radio team, nobody would hear this without you guys. The whole room clapped and hollered when it came time for Jessie Jo Dillon to speak. Emotional with pride for her first No. 1, Dillon thanked a multitude of people. “It takes a village and a vineyard,” she joked. “All I’ve ever wanted was to write a song as good and real as one on a timeless country record,” she said. “Like songs of my dad, Dean Dillon, Bob McDill, Craig Wiseman, Matraca Berg, Bobby Braddock, we could go on forever. “The night ‘Breakup’ went No. 1, my dad texted me and said, ‘This song is something to be proud of. From this point forward, don’t let anyone ever tell you again that country music as we know it is gone. Because you all are keeping it alive. Keep carrying the torch.’ It meant a lot to me. Immediately following the No. 1 party celebration, Swindell opened the doors to hundreds of fans, who started lining up outside The Cowan in at 11 a.m. in the pouring rain, to join the industry crowd of songwriters, tastemakers, friends and media who stayed for the official launch party hosted by Sugarlands Distilling Company to celebrate Swindell’s line of moonshine and his new flavor, Pre Show Punch. Pre Show Punch is the followup of his Peppermint moonshine released in late 2018.